Hope you are having a great weekend. Here is all of this week's Royal Caribbean cruise news. Symphony of the Seas completed its first set of sea trials earlier this week. The sea trials took place between February 15 and 18, where almost every onboard system was tested. 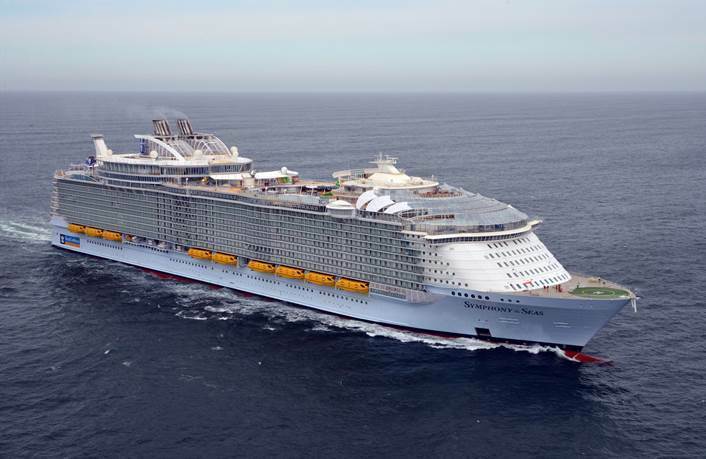 The ship is in its "completion phase", which means it is getting prepared to be delivered to Royal Caribbean in late March. The sea trials included over 80 hours of sailing that covered 1,000 nautical miles off Belle-Île island. During the trials, the full range of the ship’s systems were activated at sea, most of those being already adjusted and presented for commissioning, both to Royal Caribbean and to the classification society. Symphony of the Seas will have a new set of sea trials scheduled for March 3rd. Royal Caribbean shared photos of Symphony of the Seas' sea trials. A new drone video was released, offering a look at every angle of Symphony of the Seas. Ovation of the Seas hosted the biggest game of Hide and Seek. We reviewed the Izumi sushi making class on Brilliance of the Seas. Royal Caribbean will be hosting a website usability test in mid-March. Royal Caribbean produced a new video that offers a hyperlapse look at Symphony of the Seas' construction. Royal Caribbean was named one of the World's Most Ethical Companies for the third year in a row. The 238th episode of the Royal Caribbean Blog Podcast is now available that focuses on answering the many emails we receive from podcast listeners. In this episode, Matt opens up the Royal Caribbean Blog Podcast inbox and dedicates the entire episode to answering questions and comments sent in by listeners. Tampa Bay Business Journal reports Port Tampa Bay saw record cruise passenger weekends (thanks in part to Royal Caribbean). Travel Codex looked at Liberty of the Seas and the activities offered onboard a recent cruise.